In the past few weeks I’ve tried to confront my anxiety about how to display my work by seeing a lot of exhibitions. These ones were particularly useful. Waterfront Galley, Ipswich. Annabel is interested in the stories objects tell. Here she was showing 135 paintings of objects, and had simply pinned them all on the main gallery wall. The effect was far more powerful and thought provoking than if they had been shown individually and more formally. I have wondered how to show my little original paintings, which are all different experiments, on different surface, because individually some look rather rough and insignificant. Annabel’s display proved how much more they might be able to convey if I decided to show them as a group in a similar simple way. James Coleman at Marian Goodman Gallery, London This was totally inspiring! 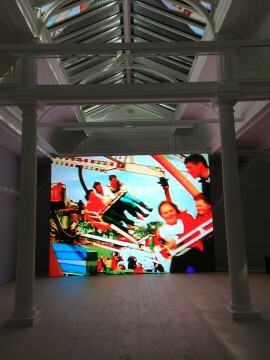 A fantastic gallery – in a georgian warehouse – with lovely varied spaces. Coleman was projecting or screening in every room including the stairwell, all the work dealing with how a photographic image gathers meaning over time and with the complicity of its viewers. His Untitled, 2011-15 was my favourite. 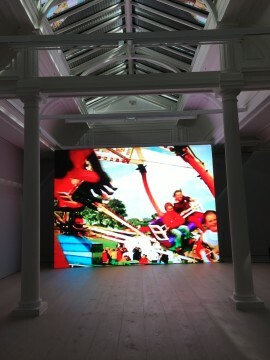 This was a huge projection in dazzling colours of just a couple of clips of people on a carousel, hurtling towards us viewers to the soundtrack of a monster pulse. It was overwhelming and hypnotic, and joyful – made me amazed at what we can see and experience in life, and the power of a mere image to record, celebrate and share it. And it really convinced me that my projection is worth getting right. I’d love to show a video, but can’t find one to link to, and this one’s so good, you should really see it for yourselves! 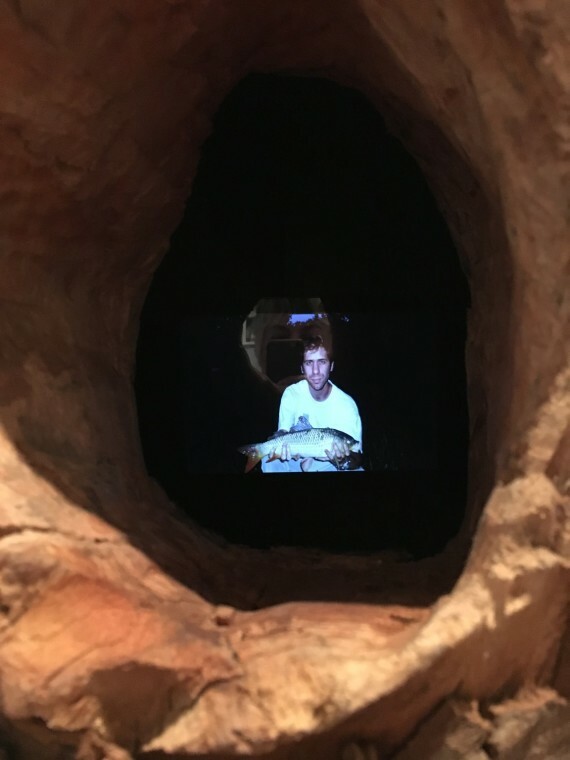 Thomas Mailaender, Gone Fishing, 2015 at Tate Modern’s Performing for the Camera exhibition I loved this piece. It is a tiny screen showing reconstructed found photos inside a plane tree with the artist reading fake letters on a sound track. All these elements construct a narrative that is so dominant that the screen and its images seem subordinate. However, seeing the tiny lit screen in its gloomy hollow gave the images a jewel like quality that made them seem super-important and truthful, even though they were not. My tutor Robin had suggested I check this one out, and I can see that an enclosed (treeless!) small screen could be a good way to show some of my pieces. This was an image projected from behind onto perspex, and the woman moved slightly as a soundtrack of her voice played. I wonder whether I could project this way? And whether it would work well for my project. Maybe it would be a good way of showing all my little originals? 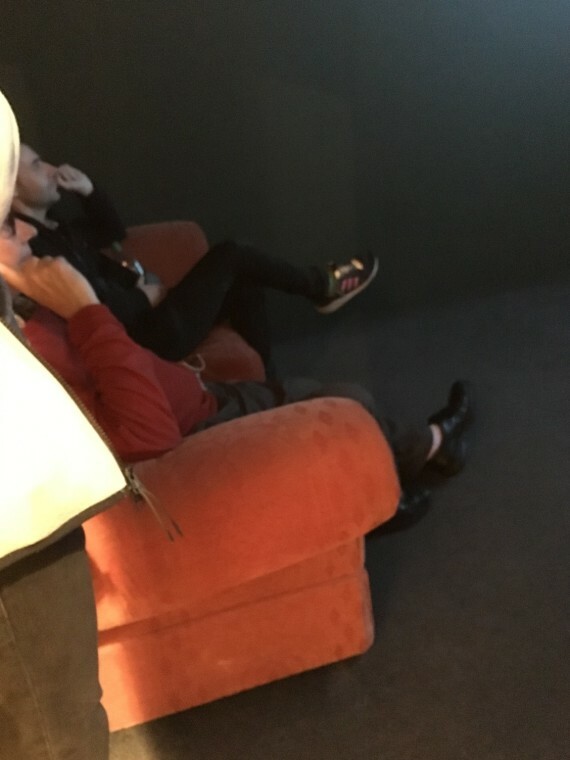 It was not clear from the description in the gallery whether this was a hologram or a projection. I need to investigate projecting holograms. I want to avoid this, keeping the viewing central to my show, but also intimate – which may be quite a challenge! 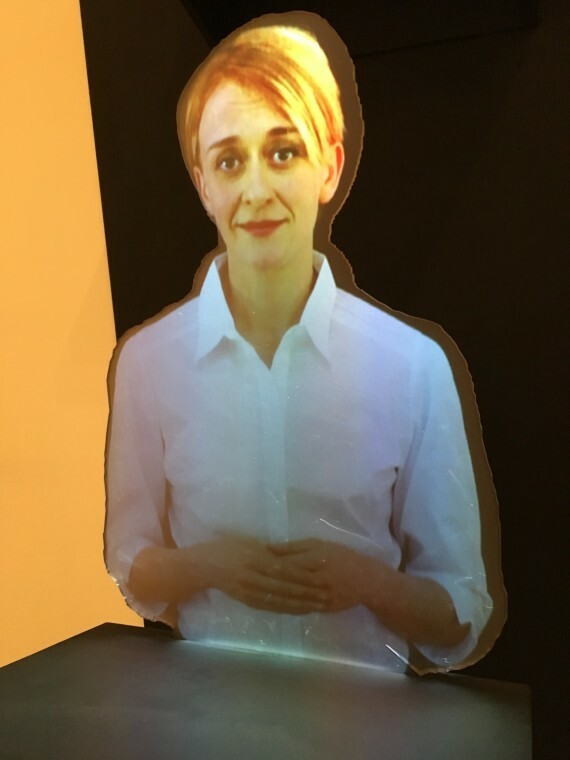 Finally I found the Wellcome Collection, and their exhibition ‘States of Mind’: Tracing the edges of consciousness which I had sought out because I thought it might have an interesting projection installation. In fact what really caught my eye was a pamphlet, A.R. HOPWOOD’S FALSE MEMORY ARCHIVE. 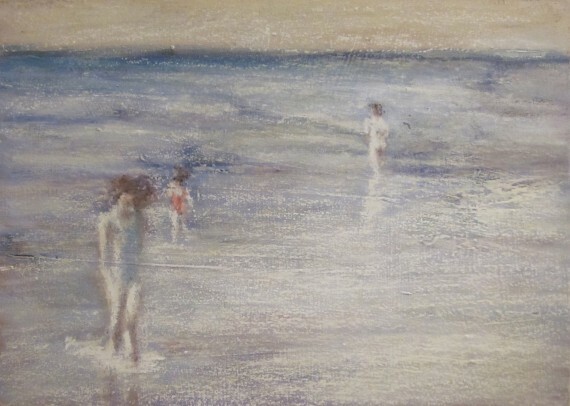 The artist A.R.Hopwood, Wellcome Collection Engagement Fellow, has been collecting ‘false’ and ‘non-believed’ memories for a touring exhibition. It is fascinating, and made me consider my own work afresh and consider the difference in our projects. His deals with a very similar narrative issue to mine, but I’m looking at traces of the process of evolution of ‘memory’, and how that conjures validity, or gaps, or difference, whereas he is examining the fact that some memories are believed by their rememberer, when evidence proves they could not be true. He gave me a useful way to pin down my work and feel more directed, something that has been a worry.